I'm sitting at my computer munching on raw carrots and hummus. I'm procrastinating again. No, really, I'm waiting for the fries to finish baking in the oven. I can hear them whistling from here. Fries whistle? Today I'm going to finish picking the other 3/4ths of the berry bushes. It's like that this time of year on my property. 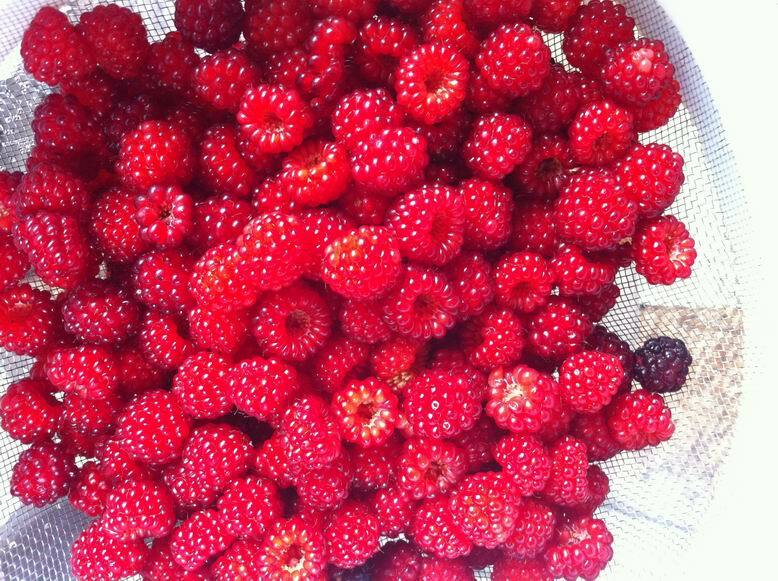 I could pick berries every day for about 6 weeks. I'm covered with scratches. It's very lovely. We still haven't listed the house. It looks like next week will be the big week. We have to finish all the nitty gritty little stuff that takes much longer than you think. Coffee helps. I'm watching my boys filming bad guy movies outside my window again. Today they've set up the tripod. It's getting serious now. It's better than TV. Well, there movies are too, but I was thinking that it's better than having them veg in front of the TV. Their movies are rather comical. It's kind of a kid's version of Black Ops meets Cartoons. They miraculously come alive after being shot. I think they'll figure it out by the time they grow up that it's not real... There's also a little Mr. Bean inspiration going on. Who knows what will come of this.